Here is the Free Feng Shui Tong Shu Almanac for Friday 17th April 2015. Hi Daniel no worries. My birthday is 9 Sept 1987 and my husband to be\’s birthday is 2 July 1989. We have somewhat settled for 6th February 2016 but of cos would love your input. Thanks! I have listed you and your Fiancés best dates for a wedding for the whole of 2016 below. December – 3, 4, 11, 12, 13, 16, 17, 23, 24, 25, 28, 29. I hope this helps you both find a date that is compatible for you both! Hi Daniel, thanks for your quick reply. what about the 23rd of April or the 21 of May? May I know how you calculate our best date? Ideally we would love a saturday wedding but we arent sure which date would be the best for us in the first half of 2016. Hi Jennifer, I\’m afraid I lost your birth dates; could you please resend them and I will check the dates for you both. The 30th April 2016 is a bad day for marriage for you both personally although the 7th May is good for the both of you. Please feel free to run any other potential wedding dates by me and I\’ll get back to you as soon as I can. HI there, my boyfriend (now fiancé) proposed to me on 17th April 2015. His zodiac sign is that of a snake and i\’m a rabbit. Do you think this will bring us long term bad luck? Firstly, congratulations. The 17th April was only a unfortunate day for weddings so I would not worry about this. 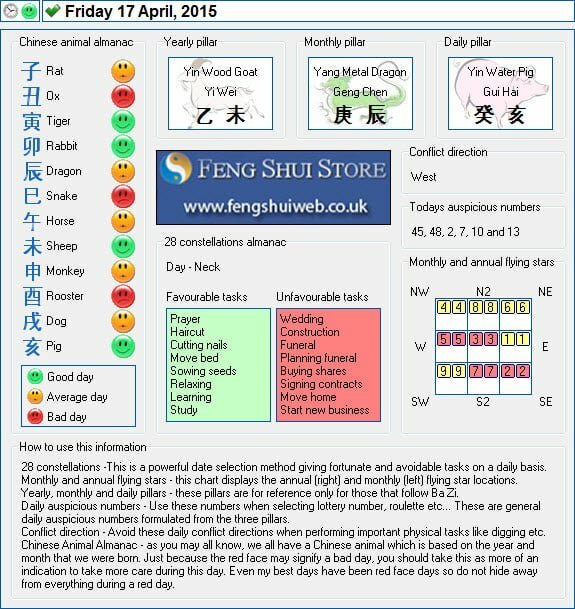 I have also copied the analysis from our Academy of Feng Shui Software for the Rabbit and Snake who get along very well. The Snake and Rabbit share a lot of the same interests and attitudes and relations between these two animals will be very good. In a parent and child relationship the Snake parent will be of great benefit to the young Rabbit who will always try to please their parent. They have a very good understanding for each other which will cause the relationship between the Snake and Rabbit to be very good. As co-workers the Snake and Rabbit both have the skills and ideas needed to work very hard together but might sometimes lack the enthusiasm to realize their full potential. There could be a lot of consideration and preparation in their ventures and would benefit from having another person motivating them, they will do very well together once they have the drive to do so. In a romantic relationship the Snake and Rabbit will find much happiness together. They both enjoy a quiet and peaceful lifestyle and will have a great deal of interests that they can share with each other. They will support each other at all times and the Rabbit will admire having such a considerate and calm partner. They will be a great match.